Another posting from my coursework. They're coming thick and fast now. 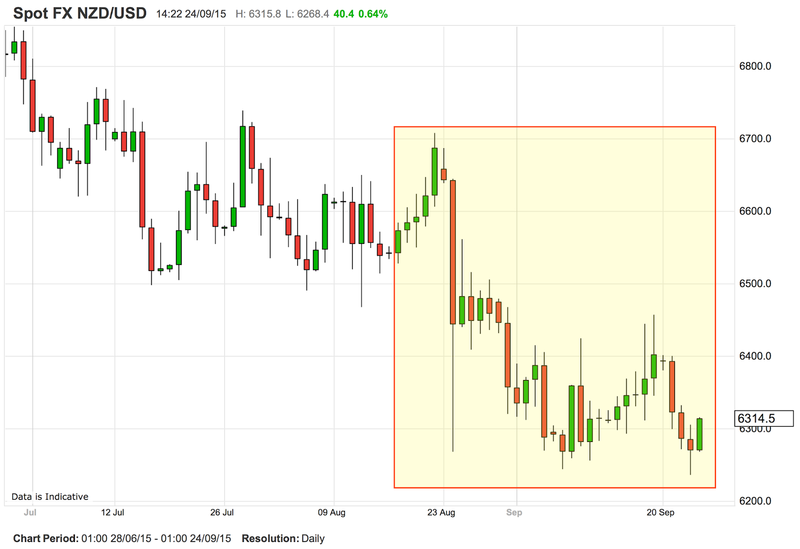 The EURUSD trade from a couple of days ago paid off nicely. 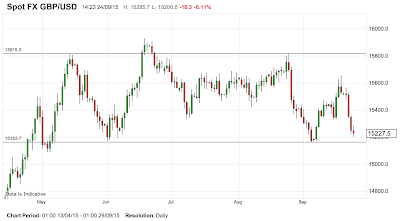 GBPUSD has finally reached the 1.5166 support line which is the low of Sep 4th and Jun 1st. 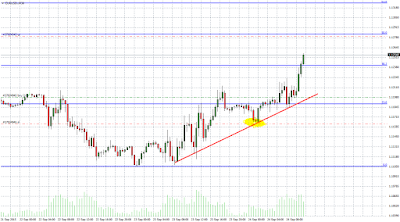 There is therefore potential for a profitable long entry, as the chance of a reversal here is very high. So, I want to go long, but need a target. So I added a fib range, being conservative, and using the Aug 25 high of 1.5818 at 100%, rather than the Jun 18 high of 1.5930. My default strategy on major reversals is to assume a 50% retrace, but to make sure, I drew a descending trend line from the high through the intermediate high of Sep 18. It is visually immediately clear that the line leaves time for that 50% to be hit. However, for additional caution, I split the trade into one contract to reach said 50% line (1.5491) and one to reach the less amibitious target of a 38.2% retracement. 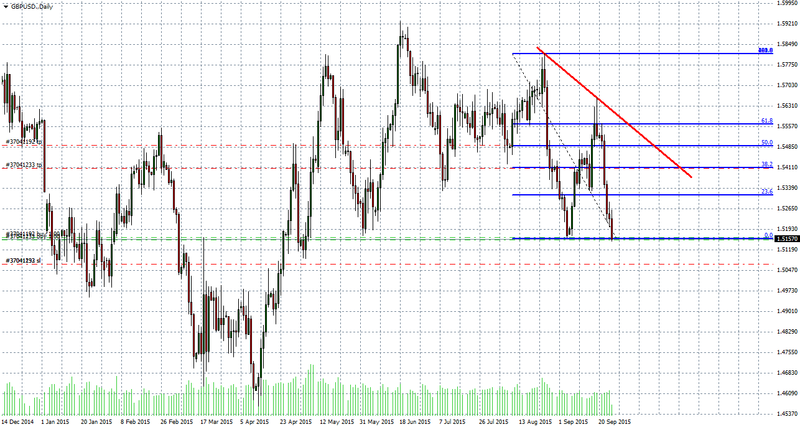 I placed my stops 20 pips below the May 4th low at 1.5070. Yet another post from my course, this time challenging a fellow student who believes GBPNZD is about to break down. The technicals are good for this (see final chart), but I argue that the larger view, including NZD fundamentals, suggests the breakout is false. Just to be contrary on this, I had a look at the technicals on GBPUSD D1, and we are very close, only about 60 pips away from strong long term support in the horizontal channel, following a disastrous few days for sterling. This suggests recovery at that point. 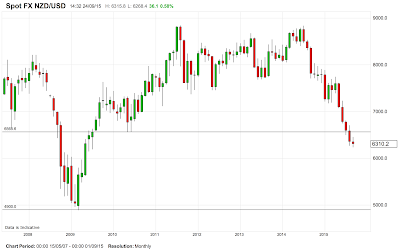 Conversely, when we look at NZD, this currency is also falling, although it has not fallen like GBP within September. 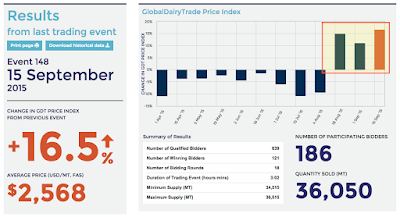 Of more concern however is the dairy auction prices, the well-known soft commodity proxy for the Kiwi, you will note that after a year of falling prices, there have been continual substantial rises (highlighted) in the price of wholesale milk since August 15th. However, when we look at NZDUSD for that period, the same dates (also highlighted) show no equivalent recovery in the currency. and indeed, looking at NZD in the longer term, it is clear that it broke major support last month, and there is no real visible support all the way down to 2:1 parity. This is in line with the view of the RBNZ who want more and more devaluation, and at 2.75% prime rate, and no QE still have plenty of room to manoeuvre. 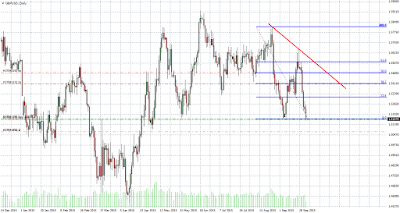 I have to therefore regard the apparent breakdown of GBPNZD as false, like in was on 23 August. 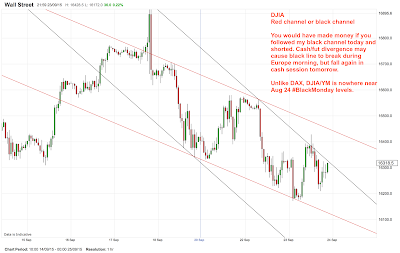 Following yesterday's posts, the DJIA has performed exactly as I said it would, falsely breaking out of the black tramline channel in the overnight and European session, and then returning sharply into channel when US buyers arrived. Here is the chart at 12:30 UK time. It is perfectly clear that one of these tramline sets is working, probably the black one, but in any event, a drop to 16025 seems inevitable in either scenario. In short we are still selling rallies. 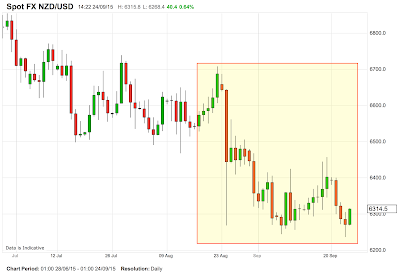 EURGBP has been similarly successful since this morning's post. 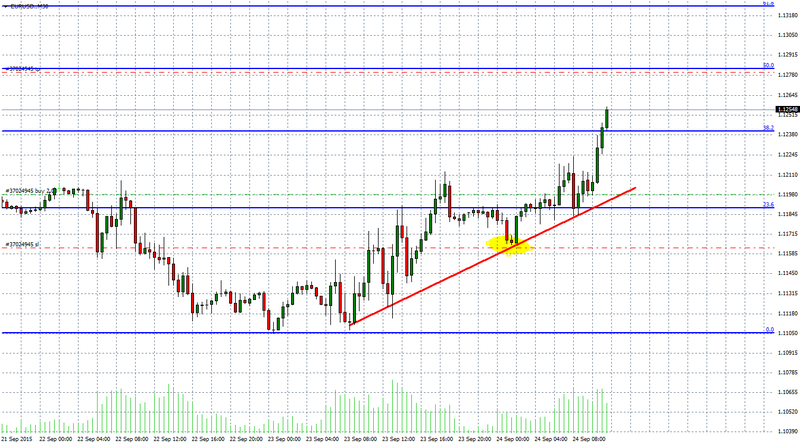 It has smashed through the 38.2% target and is well on it's way to my ultimate 50% target of 1.1280. I took half off at 38.2% as per my plan. I don't regret this. Sticking to a plan is more important than today's profit. Note I am learning to use MT4 for my currency trades. Another entry from my coursework. 1. Last week saw a very wide range, from 1.1460 (high) to 1.1105 (low). 3. It will now reach the 38.2% barrier and even the 50% barrier. Here is the Fibonacci retracement on the H4 chart. 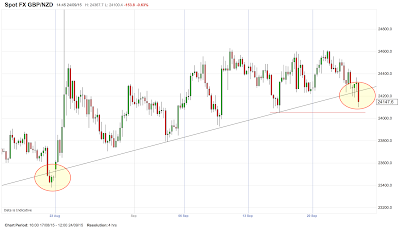 The price has slipped back below the 23.6%, for a better entry in my view, but the trend is still clear. 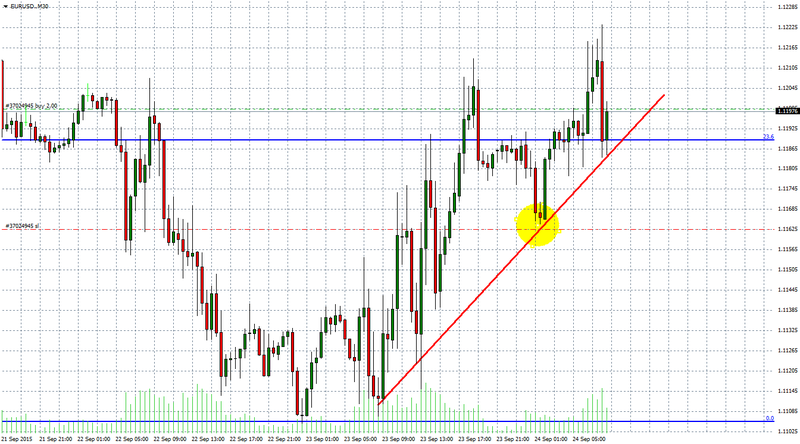 My long entry is at market, 1.11982. 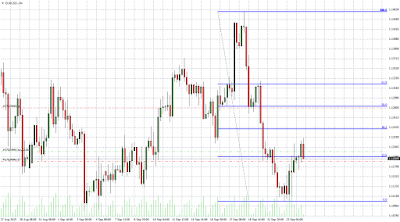 I have entered two contracts, one to target the 38.2% fib at 1.1240 and one to reach the 50% fib at 1.1280. To rely solely on the red line holding would allow a very tight stop of 1.1180, which is where I would go with a day-trade. However, to add a little bit of safety, I decided to accommodate last nights Asian reversal (see yellow circle), and go under that low. It is only an extra 16 pips, and given my targets I can afford to be generous. I therefore set the stop at 1.1162. Average trade return is (1.17+2.28)/1 = 1.725:1. 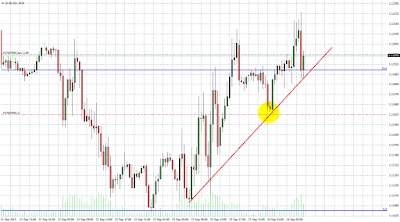 However, when the first target is hit, I will move the stop loss on the second trade to break-even. As promised, here is a piece I wrote today for my course about the movement of the Dow Jones Industrial Average (DJIA), with some background on the index, and it's behaviour today. Some knowledge is assumed. The Dow Jones 30-share industrial average is the most visible market in the world, quoted as THE market in layman's business news. 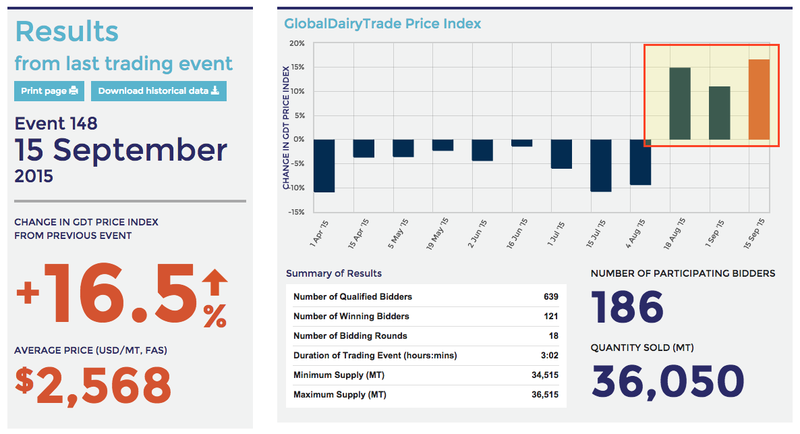 It is also the most traded index after the DAX for European index daytraders. IG Markets, the UK's largest spreadbet firm tell me that over half their entire business is the DAX and the DJIA. You must never call it DOW, as that refers to a chemical company. It is traded in the US via the DIA ETF, often called the 'Diamonds' like SPY is called the 'Spider', although there, it is nowhere near as popular as SPY. If we are being strict, SPY and DIA are both 'spiders', as they are both ETFs which are 'Standard & Poor Depositary Receipts', but the name is principally used for the S&P 500 ETF. The symbol given to the cash index (as traded 0930-1600 New York time) by most retail traders is DJIA or ^DJI although older commentators use the official ticker code of INDU. The Dow futures are referred to by the code YM_F (all futures are like this, gold is GC_F, oil is CL_F, copper is HG_F, (oddly not CU_F, there is no futures market in mercury! ), and so on. How many of you knew that EURUSD futures (or strictly forwards in FX) are called 6E_F. 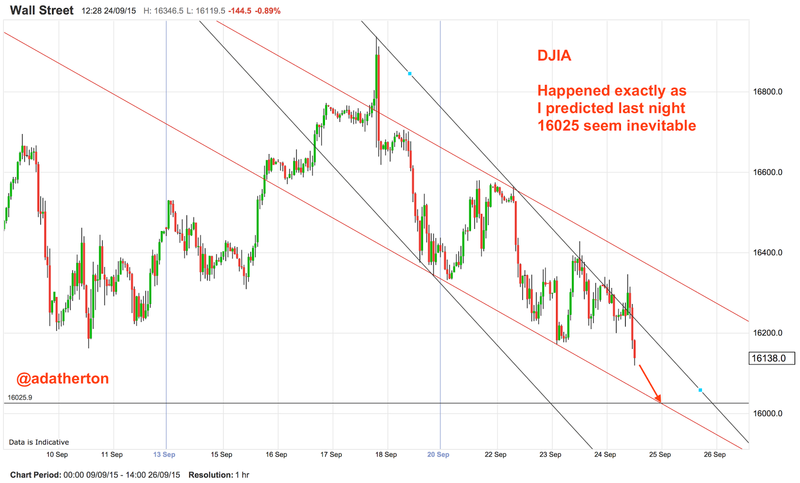 Anyway, back to the DJIA. Because it is primarily traded by European retail traders through spreadbetting or CFDs, the price is normally given as a blend of futures and cash, allowing spreadbet brokers to quote a near 24 hour price. All this is background to a couple of charts I am posting, which I also posted today on Twitter. Here is the first one, which is self-explanatory. 1. 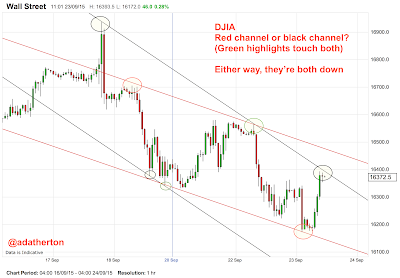 Both channels are down, so shorting has a better risk/reward, ie is safer. 2. 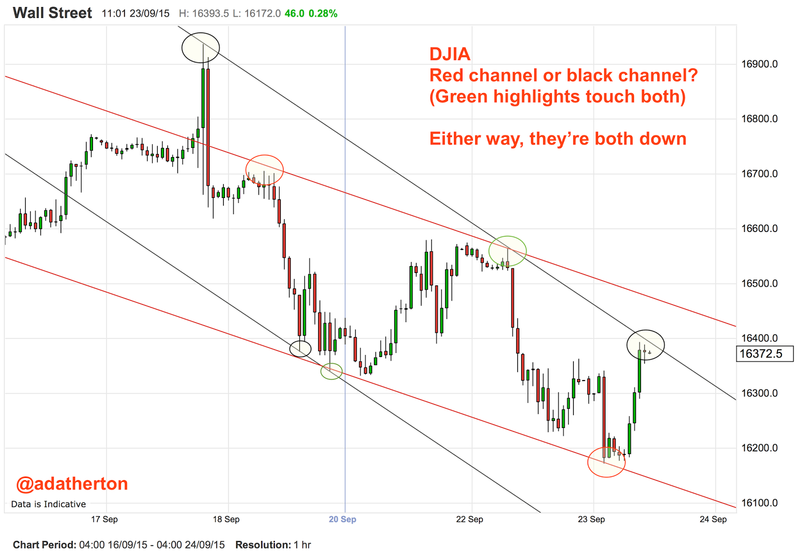 The red channel has more touches, so appears to be more valid. The right answer of course is to wait. 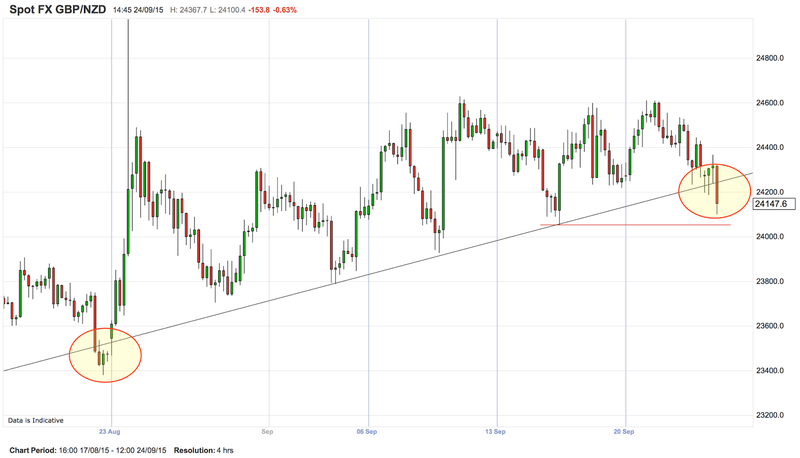 The three sharp hourly candles that raised the index by 175 points commonly cause short-term exhaustion. This might also be expressed as being overbought on the short-term RSI, although traders rarely use RSI for periods of less than a day. So let's see what happened. The next chart was posted after the end of the day. At 12:00 UK time, which is 7am in New York, where the first traders get to their desks, the index briefly spiked. It was only a spike, you can see the large candle tail (called a 'shooting star') briefly break out from the black line and retreat. The rest of the day was inside the line, with, unsurprisingly another attempt at the end of the day when the volume builds up. Note also that the low of the day was much higher than the futures low from the previous night - which had been depressed by Chinese news. That low was caused by Asian traders, selling YM_F on the Globex market, in relatively small volumes. 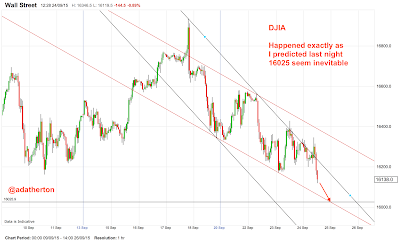 Europe was less concerned hence why it shot up in the morning (and to an extent followed European indices). So what will happen now. It is clear that we have a pattern of Asian bearishness, European bullishness, and US bearishness. 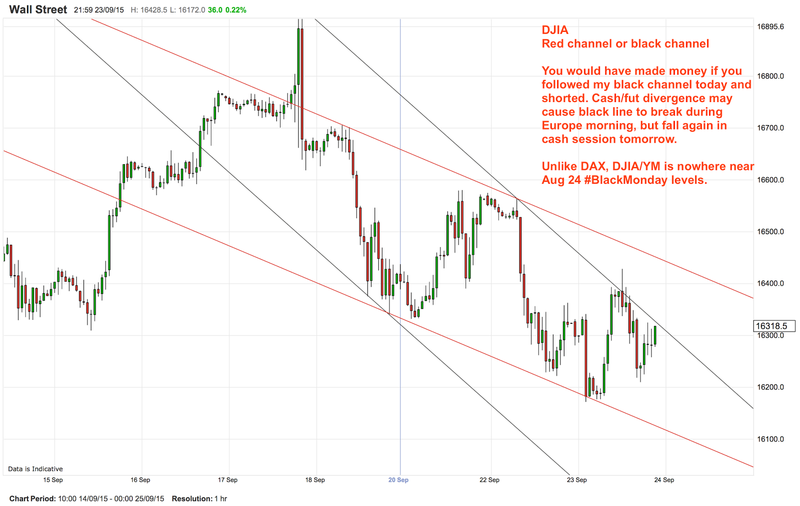 We need to look at the DAX, which will drive YM_F tomorrow morning. 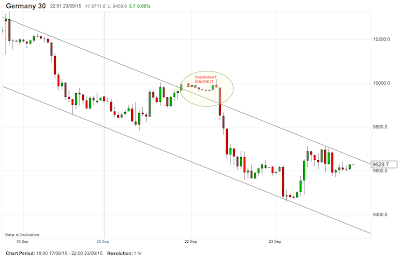 The DAX is in a downtrend, although having hit channel bottom overnight, duly performed a rally. When nothing happens overnight, you can give reduced credence to breakouts, as in the false breakout of the night of 21/22 September, which was quickly corrected when the cash market opened the next day. 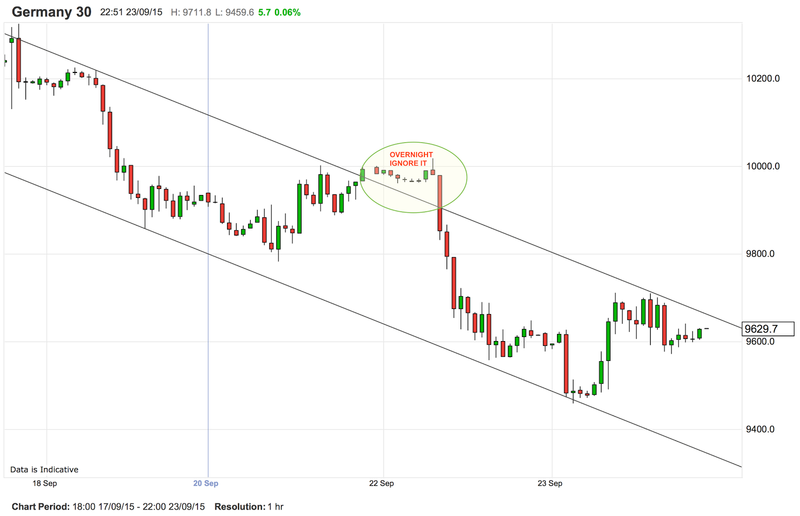 The DAX has now moved to being very close to the top of it's downward channel. The US session dragged it down, or was it just technicals that did that. Note the channel is very precise despite the effect of the VW, BMW and MB share crashes. Indices are like that, the money has to go somewhere else in the index (some funds can only buy the 30 DAX shares, although they have freedom to pick which ones). The DAX downtrend gradient is quite steep, and I will be watching closely to see if there is a breakout tomorrow. If there is, then I will check if YM_F follows suit. I will then check if the YM_F breakout spikes and does not correct around 1200 UK time. All three must be true to change my bearish view. Otherwise I will continue to short rallies. Buying dips seems so long ago in this market.